For this story, the International Consortium of Investigative Journalists teamed with ABC News to look at tobacco’s grip on Indonesia. Watch the full segment tonight on ABC’s 20/20. Atika’s own lung problem had her down again, recalled her brother Faisal Rizal. Her parents had checked her into a clinic. Later, Atika wrote that she was still waiting for a transfer to a bigger hospital. Noor Atika Hasanah passed away later that day. Atika’s chronicling of her illness offered friends and family an unusual glimpse at the consequences of runaway tobacco consumption in Indonesia, yet her death to tobacco-related disease is not unusual in one of the world’s last holdouts against signing the World Health Organization's treaty to limit the tobacco industry’s influence by restricting tobacco advertising and raising excise taxes. With a population of around 240 million and weak government regulations, Indonesia is one of Big Tobacco’s smoking giants. As of 2009, 28 percent of Indonesian adults were smokers and more than half of men smoke, according to the World Lung Foundation. 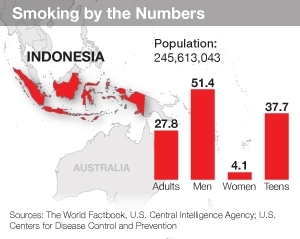 Around 200,000 people die each year in Indonesia because of smoking-related sickness. At least 25,000 of the dead are like Atika — young, female and passive smokers, according to the WHO. Atika’s story went little noticed outside her circle of friends. That’s a sharp contrast to Aldi Rizal, who in 2010 became global sensation at age two, shown on television news and internet video puffing away at some of the 40 or so cigarettes he consumed each day. The media attention embarrassed the government, which quickly paid for medical help needed to cure his addiction. 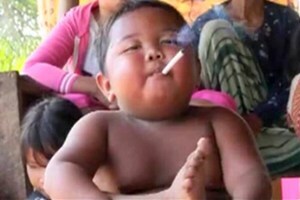 But the quick attention to the smoking toddler could not hide a startling number: In 2006 — the last year for which survey data is available for Indonesia — the prevalence of smokers ages 13-15 was 38 percent, one of the world's highest per-capita rates of smoking among children. Tobacco’s influence on the politics of smoking in Indonesia is punctuated by what's happened to people like Atika. She had often complained about her boss and colleagues who smoked non-stop. She was employed by a government-sponsored cooperative for villagers, where she often worked late, surrounded by second-hand smoke. Her father also smoked at home, but quit in 2007. As a country, however, Indonesia does not appear ready to kick the cigarette habit. Anti-tobacco and health activists blame a combination of ineffective Indonesian politicians and the lobbying clout of global tobacco interests. Indonesia is the toughest test on the planet for health advocates who, after decades of winning tobacco restrictions in the United States and other developed nations, now must fight deep-pocketed multinational cigarette manufacturers in emerging markets and developing nations — regions that have grown to become the industry’s key source of new revenue. The Indonesian government has consistently refused to control tobacco advertisement. Indonesian legislators can’t even agree on enforcing their own, limited tobacco law — the 2009 Health Law that includes limited regulation of cigarette advertising. Anti-tobacco activists say this is because tobacco’s influence touches all walks of Indonesian life, from politics to pop music and the media. In examining tobacco in Indonesia, the International Consortium of Investigative Journalists found that cigarettes have become so much a part of everyday life that politicians don’t feel rushed to address massive electronic billboards hawking cigarettes along busy streets. No one has moved against brazen marketing like point-of-sale displays featuring mini-skirted young women at rock concerts, even in front of children’s playgrounds. And few in government thought twice about a cigarette company’s sponsorship of the summit of Southeast Asian defense ministers in May 2011. Billboards for the summit were shown prominently throughout Jakarta. “The tobacco lobby is smart. They’re adaptive. With their social responsibility campaigns, they could get a lot of parties to support them,” said Todung Mulya Lubis, a lawyer and anti-tobacco activist. “Grants from Sampoerna Foundation or Djarum Foundation could easily raise the ewuh pekewuh” — a Javanese term for not criticizing someone in public. 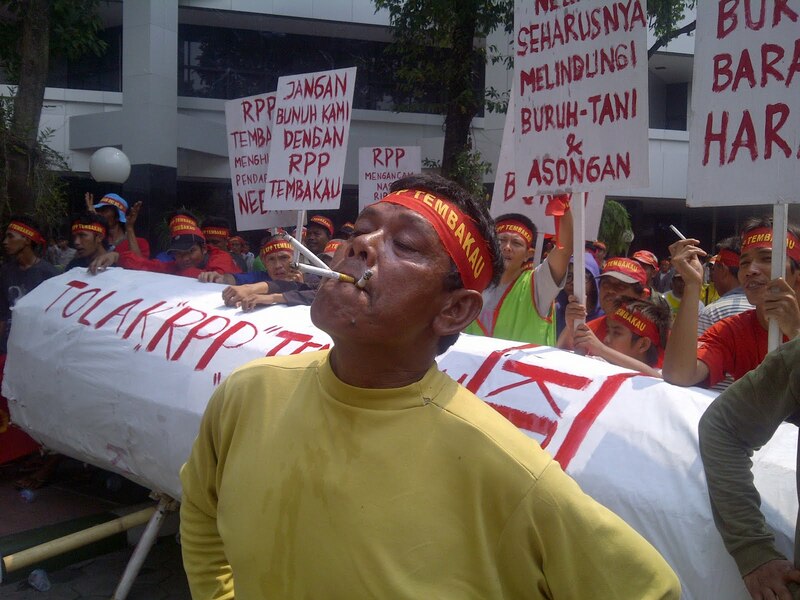 In Indonesia, tobacco is an old, strong tradition. In the 1880s, tobacco traders in Kudus, on Java Island, the most important area in the Dutch East Indies, mixed cloves and tobacco, creating kretek cigarettes. The name is an onomatopoeic term for the crackling sound of burning cloves. Kretek now means cigarette in Indonesia, with four leading manufacturers: Sampoerna, Djarum, Gudang Garam and Bentoel. Almost 90 percent of Indonesian smokers puff kretek. Indonesia’s particular — and plentiful — smokers are so valuable that in 2005 Phillip Morris International paid more than $5 billion for 97-percent ownership of the Sampoerna brand. British American Tobacco followed in 2009 with $494 million for an 85-percent stake in the Bentoel brand. The Sampoerna family established PT Hanjaya Mandala Sampoerna Tbk. in 1913 and continues to help Phillip Morris manage it. Putera Sampoerna, grandson of company founder Liem Seeng Tee, was until recently chairman of PT Hanjaya Mandala Sampoerna Tbk., while also running his Putera Sampoerna Foundation. The number 234 is a special one for the Sampoernas. 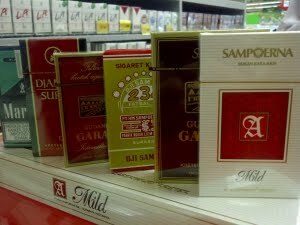 Its most famous kretek brand is Djie Sam Soe or 234 in Hokkien language. It also appeared on the building of Jurnal Nasional daily, a newspaper editorially controlled by the Merdeka Palace. In the Sampoerna family, Phillip Morris has an ally tied closely to Indonesia’s political and media hearbeats. In June 2006, two years after Susilo Bambang Yudhoyono won the presidency, the Sampoerna family started Jurnal Nasional , a daily newspaper in Jakarta. Political opponents of Yudhoyono – even journalists who work for paper – say the publication’s content is controlled from the Merdeka Palace, Indonesia’s White House. Sunaryo Sampoerna, an art collector and a nephew of Putera, was chairman of PT Media Nusa Perdana, which publishes the newspaper. The flow of money from the Sampoernas to Jurnal Nasional appears to have stopped after George J. Aditjondro, a scholar and an anti-corruption crusader, revealed connections between Yudhoyono and the newspaper in his book Membongkar Gurita Cikeas– “Uncovering the Cikeas Octopus,” published in December 2009. (Cikeas is the residence of President Yudhoyonos’ family in southern Jakarta.) The book created an uproar as Yudhoyono had won the presidential race on an anti-corruption campaign. Sunaryo Sampoerna stepped down from the newspaper board in the January 2010 shareholder meeting. The Putera Sampoerna Foundation is also into journalism, with its Adiwarta Sampoerna Award for reporters covering legal, arts, business and environmental matters. Award ceremonies were always filled with Sampoerna banners, logo and souvenirs. The juries have included Sampoerna executives. “On top of their advertising and sponsorship, the journalist award is a very effective method to reach out to the subconscious of journalists,” said Wahyu Dhyatmika, leader of Jakarta’s Alliance of Independent Journalists. Yudhoyono “is not a smoker, but he’s a friend of the cigarette companies,” Todung Mulya Lubis said. Yudhoyono's spokesman declined requests for comment from ICIJ, and Sampoerna family members and foundation officials declined requests for interviews about Jurnal Nasional and the journalism competition. 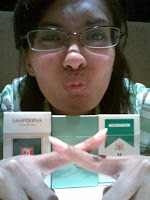 Further punctuation of the relationship between Sampoerna and Yudhoyono are the numbers 234 and 9, which show up often in the tobacco family’s story and on the license plate of the Rolls Royce that Sampoerna was once allowed to routinely park at Merdeka Palace, according to journalist Wisnu Nugroho, who chronicled the tobacco baron’s visits to President Yudhoyono. 234 is a special number for the Sampoernas. Putera Sampoerna’s grandfather, Liem Seeng Tee, was an immigrant from Hokkien, in southern China, who landed in Java and set up his tobacco company in 1913. Seeng Tee was superstitious. He named his most famous kretek brand 234 — Djie Sam Soe in the Hokkien language. Mathematically, 2+3+4 equals nine — what Sampoerna has said is his lucky number. Jurnal Nasional’s first office on Pramuka Street in Jakarta was also numbered 234. Tulus Abadi, coordinator of the Indonesian Consumers Foundation, which campaigns for tobacco control, recalls the visit to the Merdeka Palace by a delegation of anti-tobacco advocates whom he supported. As they met with First Lady Kristiani Herrawati Yudhoyono, she told the group she’d help them, as long as they did not talk about cigarettes. On May 31, 2008, a World No Tobacco Day, Mrs. Yudhoyono also made a speech at the Merdeka Palace. She said cigarette advertisements were misleading and encouraged teenagers to start smoking. She reminded children not to smoke. But behind the scenes, said a health activist who attended the event, Merdeka Palace officials told the organizers that they should not say anything publicly about the WHO’s tobacco-control treaty. These events sustain a suspicion among health activists that the tobacco industry has a firm grip on Indonesian policymakers. Tobacco companies also are active financial supporters of sports and arts events and programs. They employ six million people in Indonesia, directly and indirectly, according to the Indonesian Alliance of Tobacco Societies. And tobacco companies claim that in 2009 they paid about 55 trillion rupiah in taxes — around $6.4 billion — and account for almost 10 percent of the nation’s public revenue. Because of those numbers, health activists said they were suspicious of President Yudhoyono's withdrawl of a nomination of the wife of an anti-tobacco crusader to be the nation’s health minister. In late July 2009, Yudhoyono won a landslide re-election, with nearly 61 percent of the total vote. His new vice president was Boediono, a former central banker. On Sunday October 18, 2009, they invited Nila Juwita Moeloek, an ophthalmologist and a professor at the University of Indonesia’s Medical School, for a talk — and then offered her the position of health minister. Moeloek later told reporters that the president and vice president talked about reaching the UN Millennium Development Goals in 2015 and that she was expected to undergo a health examination. Moeloek told ICIJ that the president did not talk about tobacco control in their first meeting. Moeloek's husband, Faried Anfasa Moeloek, was Indonesia’s health minister in the late 1990s. So her appointment excited anti-tobacco campaigners, as Anfasa Moeloek is a patron of a coalition of anti-tobacco activists. “The euphoria was reflected on our Yahoo group mailing list. 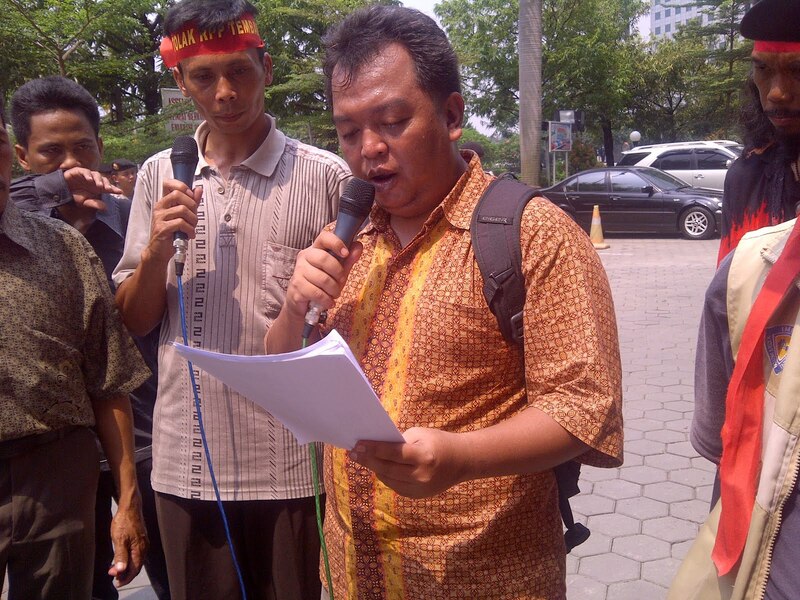 We forgot that there are spies,” Tulus Abadi said. Nila Moeloek took the presidential medical test. She had already received congratulatory phone calls and text messages on her nomination and political analysts proclaimed her health minister. But on the day she took the medical test, Kartono Mohamad, former president of Indonesia’s doctors association, was asked by Merdeka Palace officials to recommend three other names to head the health ministry. Mohamad alerted health activists and called the Moeloeks. “We were surprised when she was not invited to the Merdeka Palace,” Abadi said. Yudhoyono said Endang Rahayu Sedyaningsih, a Harvard-trained medical doctor already in the Health Ministry, would be the new chief. Andi Mallarangeng, a Yudhoyono spokesman, said Nila Moeloek had a “psychological problem” and was deemed unfit for a cabinet job. Legislators, journalists, health activists and politicians questioned the sudden change. The Republika newspaper demanded the government say why her appointment had been canceled. Nila Moeloek told ICIJ that she was surprised and hurt by the “psychologically unfit” statement. She declined, however, to comment on the motives for the abrupt change of plans. "I am not against the tobacco industries,” Nila Moeloek said. “I just want to protect small children. These kids still cannot decide yet. I don’t care about adults who decide to smoke. But a young boy who smokes will keep on smoking for decades." Later the president offered Nila Moeloek an ambassadorship, an offer she refused. Anfasa Moeloek, her husband, has eye cancer; she wants to spend more time with him. There have been attempts in Indonesia to follow the spirit of the WHO tobacco-control treaty, but the initiatives have met with strong resistance. She didn’t have to wait long for the industry’s reaction. Tobacco groups soon sent waves of protesters to her ministry. Komunitas Kretek, a Java-based tobacco group, organized rallies and launched an essay writing competition on the involvement of U.S. pharmaceutical companies in support of the anti-tobacco draft. "Developed countries like the United States are trying to make profits through the sale of nicotine-replacement drugs. But they do business through anti-smoking campaigns," said Komunitas spokesman Zulvan Kurniawan. “I smoke one to two packs of cigarette a day. I’m fine with it. Smoking is okay as long as you don’t do it too much. Compare it with eating instant noodles, 12 packs a day, or drinking Krating Daeng [an energy drink], 12 bottles a day. You will also get sick,” Kurniawan said. “This draft regulation will kill farmers, workers and street vendors,” he added. The Indonesian Alliance of Tobacco Societies, locally known as the AMTI, even pushed a campaign to label kreteks part of “Indonesia's cultural heritage” and one of Indonesia’s 10 prioritized industries. But the corporate mindset favoring tobacco now appears to cut against the public grain in Indonesia: A 2010 Indonesian Consumers Foundation survey found that 90 percent of Indonesians agree that cigarettes are addictive; 57 percent believe the government does not do enough to protect non-smokers; 88 percent had seen cigarette advertisements in the previous two weeks; and 71 percent want to ban tobacco ads. The numbers should be enough to convince legislators to move against the industry, said Tulus Abadi, the anti-tobacco activist. Indonesia’s cigarette tax is about 47 percent of the price of a pack. Legally the government could increase it to 57 percent. “These numbers speak for themselves,” Abadi said.